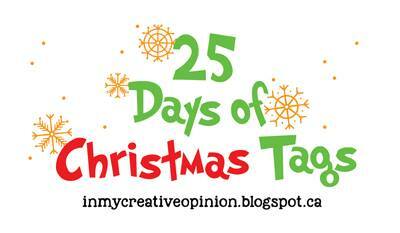 Hello crafty friends, today I'm here again to participate in Tracey McNeely's 25 Days of Christmas Tags event. 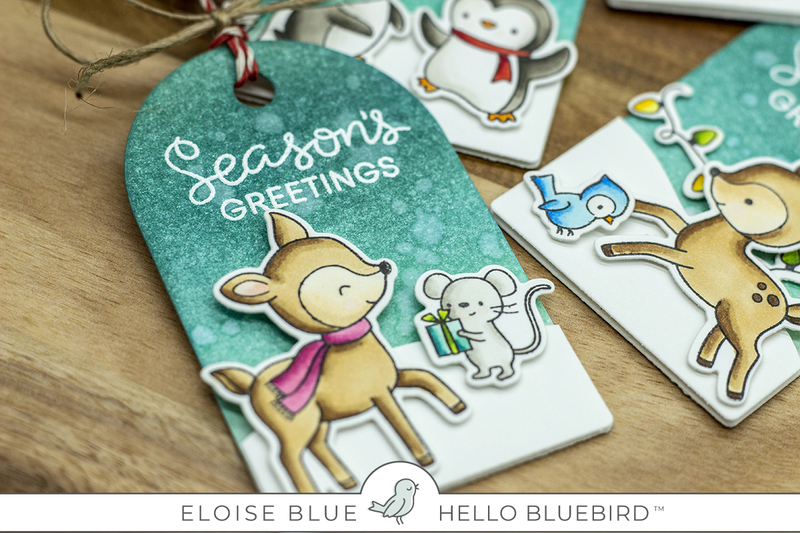 Today's inspiration comes from Hello Bluebird. I started off with stamping out my images from the Snow Play stamp set, colouring them in with Copics and cutting them out using the coordinating dies. Next I die cut four tags from watercolour cardstock and four from regular white cardstock. I used the Hill and Dale dies on the plain white tags for the snow at the bottom of each tag. I then stamped the 'Season's Greetings' sentiment from the Snow Play stamp set onto the tags and white heat embossed them. I then ink blended Evergreen Bough Peacock Feathers and Cracked Pistachio Distress Inks onto each of them. I flicked some water on top, picked it up with a paper towel and dried it off with a heat tool. I added foam tape onto the backs of all the snow drifts and images ands adhered them into place. Lastly I threaded through some twine at the tops of the tags and tied a bow using some hemp cord. Thanks so much for stopping by today. Check out Tracey's blog for more information as well as more inspiration. Thanks so much for stopping by and I'll see you soon. Fantastic tags Eloise and the distressed background colour you used is gorgeous. Very showy tags and your little scenes are just precious too. Well done. The background is STUNNING! Love the bright colors! Great coloring too! 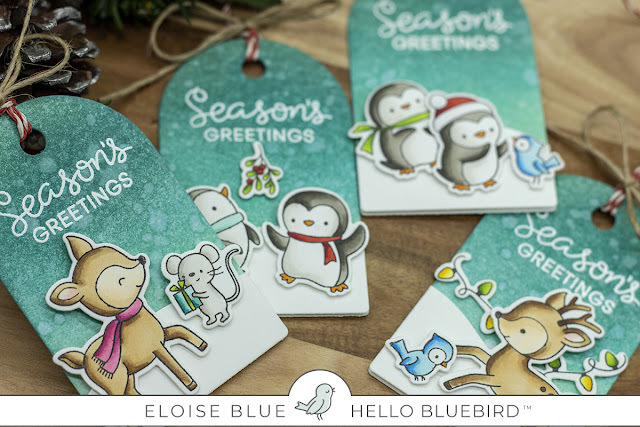 These are lovely tags - I love the distressed teal background and the critters are adorable and so cheery! Oh wow, Eloise...your backgrounds are amazing and your stamping with these sweet stamps is SO adorable. I love your creative ideas. Thanks for sharing. 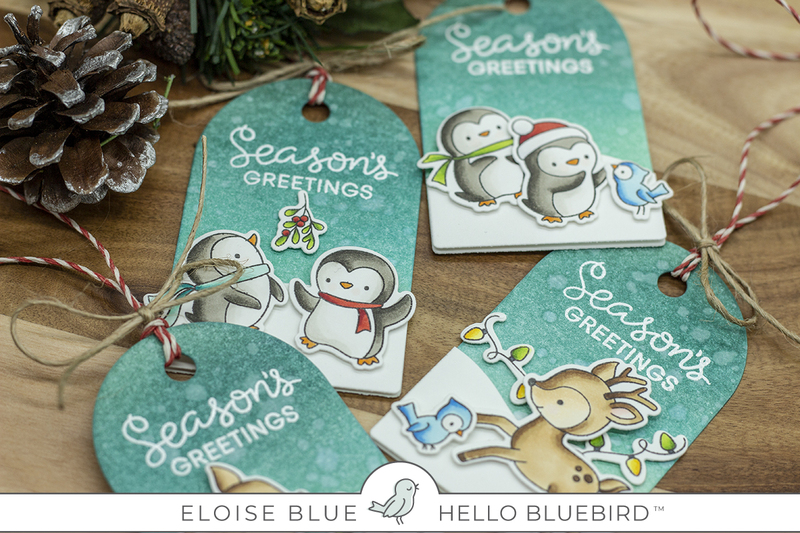 Wonderfully sweet and festive tags! Adorable little scenes and the teal backgrounds are awesome. Adorable tags, Eloise! You've inspired me on Day 25! These tags are so cute! Fabulous coloring on the critters and your ink blended backgrounds are so pretty. 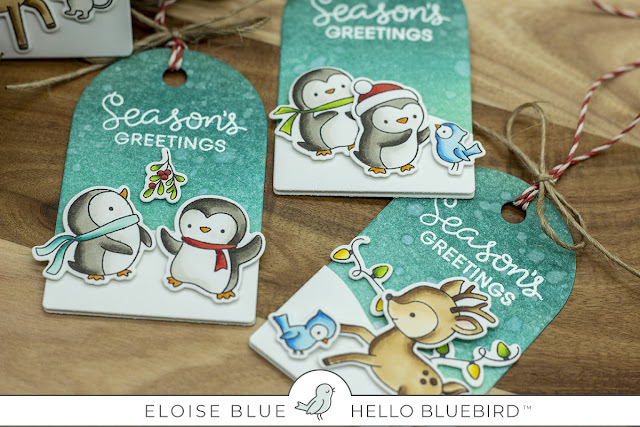 Hello Bluebird has some adorable stamps!